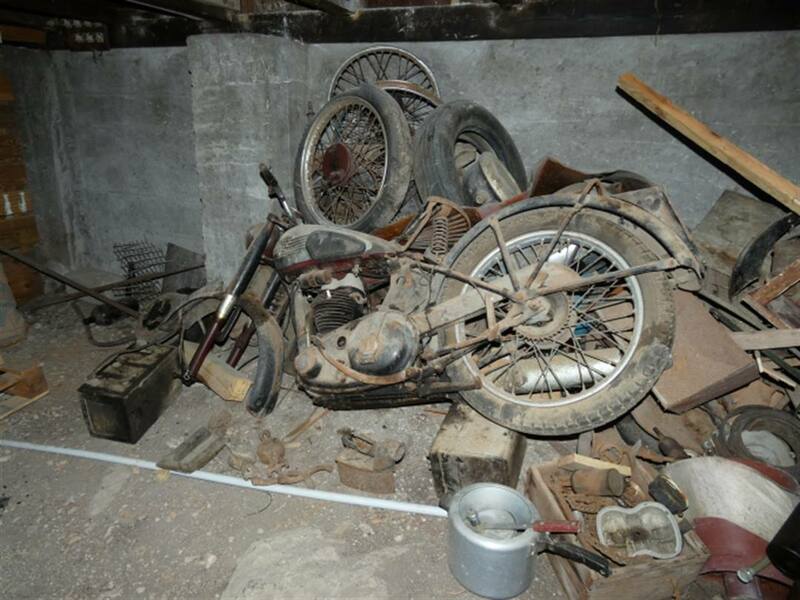 Below is a recent email exchange when an vintage motorbike is discovered under the floorboards of Riviere House in Charlestown. 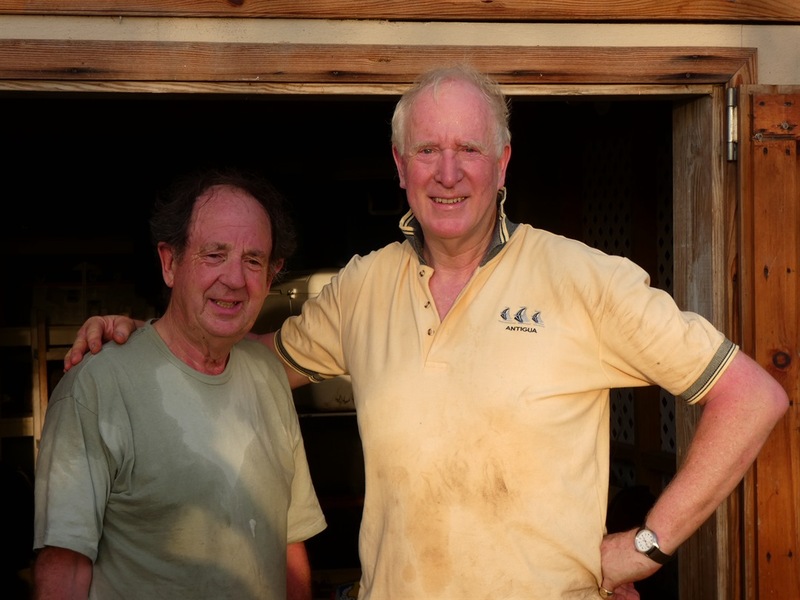 Pictured above: Thomas and Colin, motorbike resurrectionists. Well, I think we have managed to break the back of the task. The bike, now even with a front wheel attached (well done Sgt. Colin Edwards REME) emerged blinking into the warm sunlight after probably 50 years. 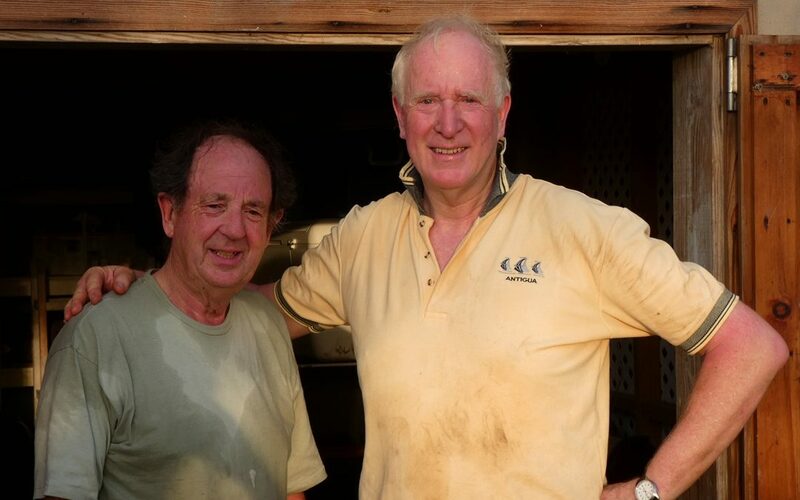 We emerged panting and grubby into the warm sunlight and looked like we had been underground for 50 years. Good to see Annie looking on and providing moral support and we have found some lovely artefacts too for her gallery like old bottles and oil lamps. Also there was some wonderful hard wood that has been taken back to the Hermitage. Thanks to Quentin we were able to have his great help and as a wonderful taxi driver. 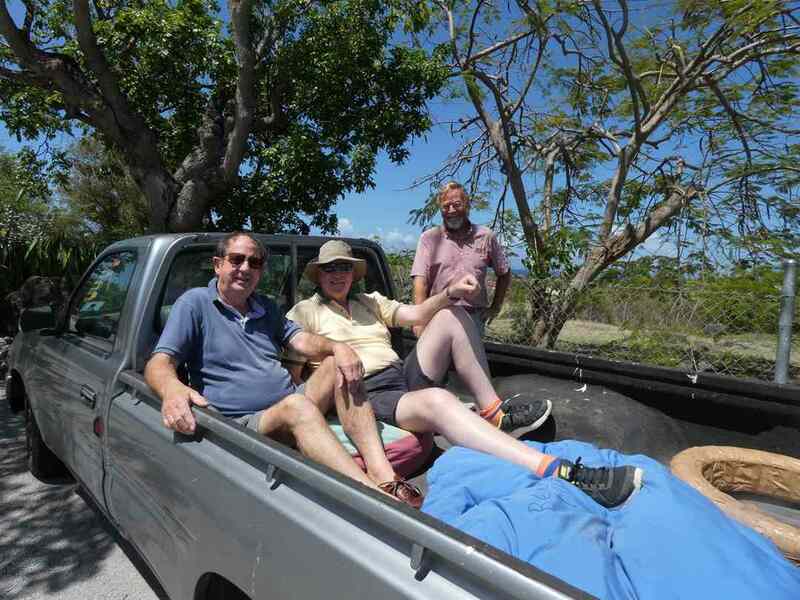 Sitting in the back of the pick-up it was deja-vu for me in some ways as I remember being in that heat in the Army in Sudan being driven around, hot, dirty but in the company of friends. But instead of planks we had a machine gun, another story! The plan now is to have a Carib beer and over the next few days clean her up a little but not too much so that the patina and history is not destroyed. Then Ian you can decide where you want to display her. The engine really is too far gone to start, but with new tyres and bits put back on her she will be a lovely conversation piece. In the gallery perhaps, suspended or an a perspex stand. It really will be worth it. More in the next few days but thank you Quentin, Annie for 2 beers and Colin for great grunt work! The BSA is starting to emerge as an fine example of British eccentricity and design. 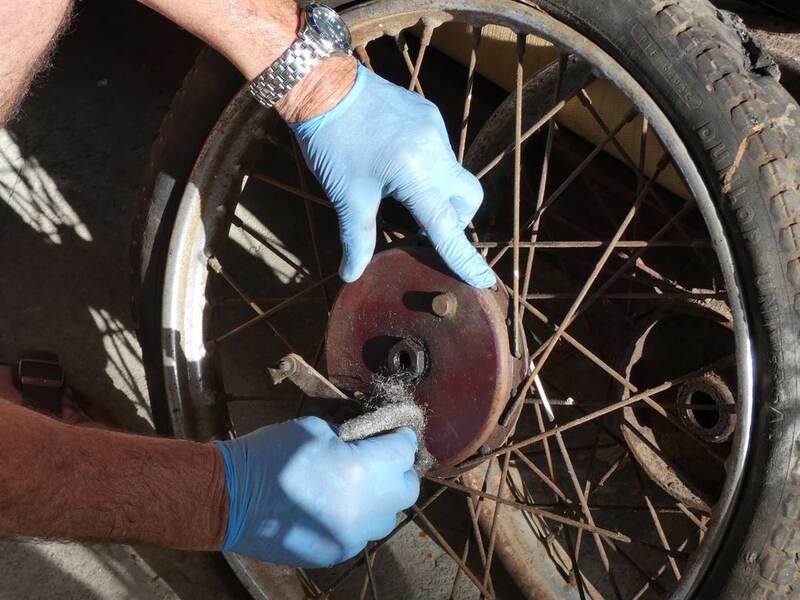 Today we managed to take the old tyre off the front wheel, well done Colin and then after much grunt work put the wheel on. The tank is now off and a start has been made on cleaning up the engine and other parts. Lovely old paint is returning to view, and we have a selection of tanks to play with, so that will be the next day’s effort. Interesting that with scratching about in the dust we have found small bits like a kickstart, oil caps but we still have to find the front wheel spindle nut. Who dropped that I wonder. Water consumption high, enthusiasm at 100% so we crack on! I am sorry that there are so few photos but do look on FaceBook for more! But will send some more after this note. Today was spent in cooler weather on a tidy of the whole bike and some small bits of restoration. While Colin tackled the headlamp I was working on the engine and fins. With wire brushes and other assets purchased at TDC it was amazing at how well the rust disappeared and metal shone. Tyres were blown up and stayed up, the nut for the front spindle was found out in the long grass and the petrol cap came up all shined and clean. So as an object she is wonderful and we have ideas, more on that later. So off for cocktails, I mean orange juice so feast on these pictures. Almost sold her to Yachtsman’s Grill for $3,000 (joke I promise IP) to cover our lunch bill! It would look great there. More to do over next days too. I am sure you are busy but I miss your replies! Anyway trust that you have had a good and deserved sunny weekend. All is well here in Nevis and The Hermitage hums along with lovely staff and guests though I recognise this is the start of the quiet season. Sadly no celebs on view but we have Anne and Ritchie to make up for that. Anything can be repaired and restored these days, it is just a question of money and time. It most cases renovation can damage the history and character of an item. 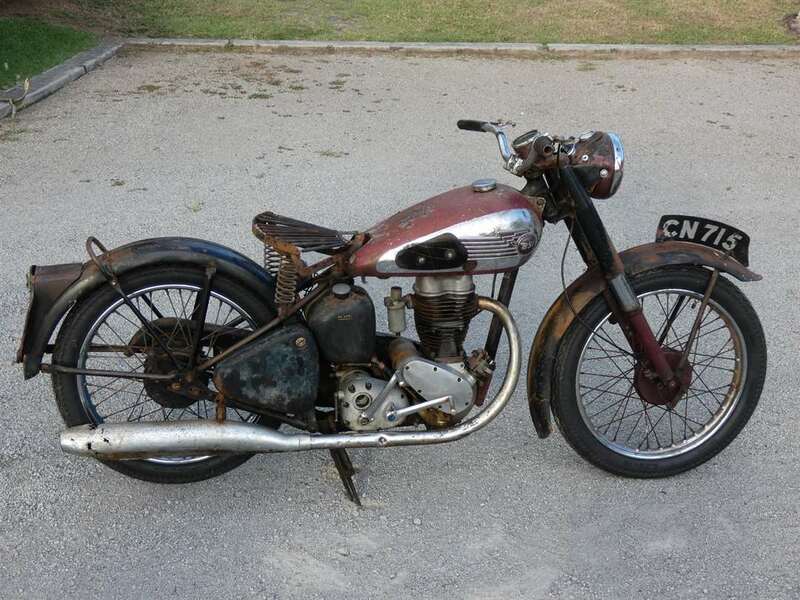 Further, and in the case of your BSA it is just not worth it for even if the engine was rebuilt the rest of the bike would need stripping to the last bolt and the gearbox is seized I am sure. In my humble opinion please leave her as she is. The character and patina ensures she (now known as Celia) is a lovely example of an aged lady resting in her last years. Celia is tactile, pretty and full of interest that will spark conversation. In monetary value as is her value at about GBP 500/800, rebuild would be in the many thousands even if you find someone and the time would be just unrealistic. I would have a lovely stand built in clean metal and place her in a gallery here with her story (written by me I hope) on a board. Or you might suspend her, again in a gallery on chains not too high though. We will leave Celia as clean as we can blinking in the warm sunshine. On opening night she will be the star and encourage industrial archeology and a photo opportunity, press and the like. Working models are available in the UK from GBP 2,000 if you want Celia to have a sister. So for now we will do a couple more days and submit our report and photographs to you. 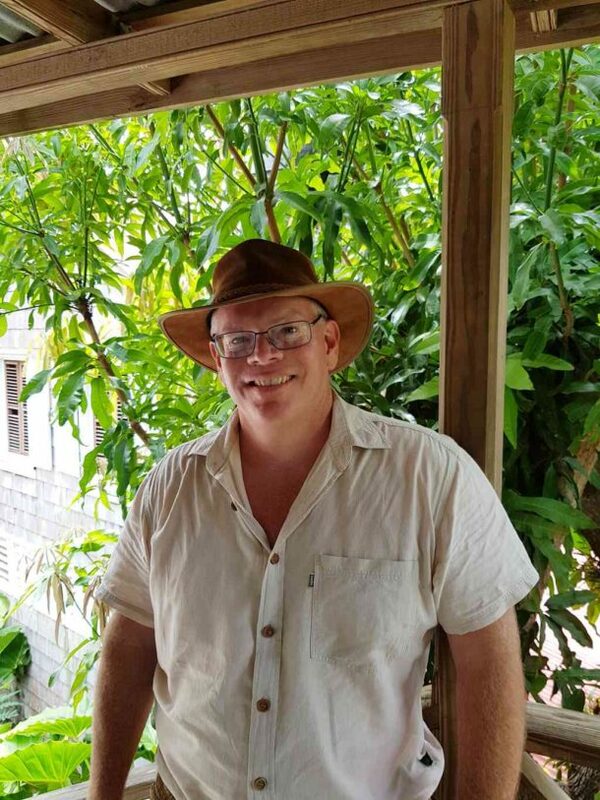 I have some other ideas and thoughts that I will send later and again thank you for allowing us to help leave a piece of history in the Caribbean.